I used some of my starter that would have been discarded last night during refreshment to make some english muffins. I found this recipe about 3 years ago on the KAF Baking Circle. It was submitted by a user going by the name chard. It makes great english muffins! The texture is similar to Wolfermans, not big "nooks and crannies", but a little meatier. I know a wetter dough would create larger holes, but I like them this way. I used semolina on the parchment while they rested, and the flavor it gives to the bottom of the muffin is fantastic. Other than only using 2 cups of flour for the whole recipe, I followed the amounts and ingredients exactly. Combine starter, 2 C of flour and milk in a large bowl. Stir to combine, cover with plastic wrap, and leave out for 8 hours or overnight. After the overnight rest, add remaining flour (I didn't add any), sugar, salt and baking soda and mix well. Turn onto a lightly floured surface and knead for 4-5 minutes. 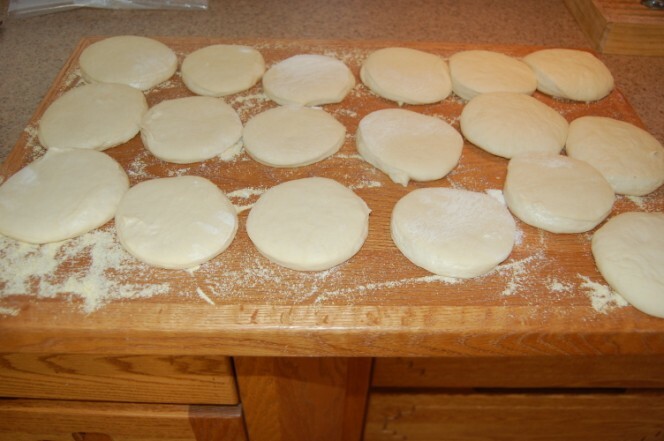 Roll out to 3/4" and cut with a biscuit cutter into rounds. You can reroll the scraps, but you may need to let the dough rest before cutting more muffins from them. Place muffins on a piece of parchment dusted with semolina and let rest for 45 minutes. Spray griddle or skillet lightly with spray oil. Heat to medium and cook muffins for about 6-8 minutes on each side, or until browned on the top and bottom and cooked through. 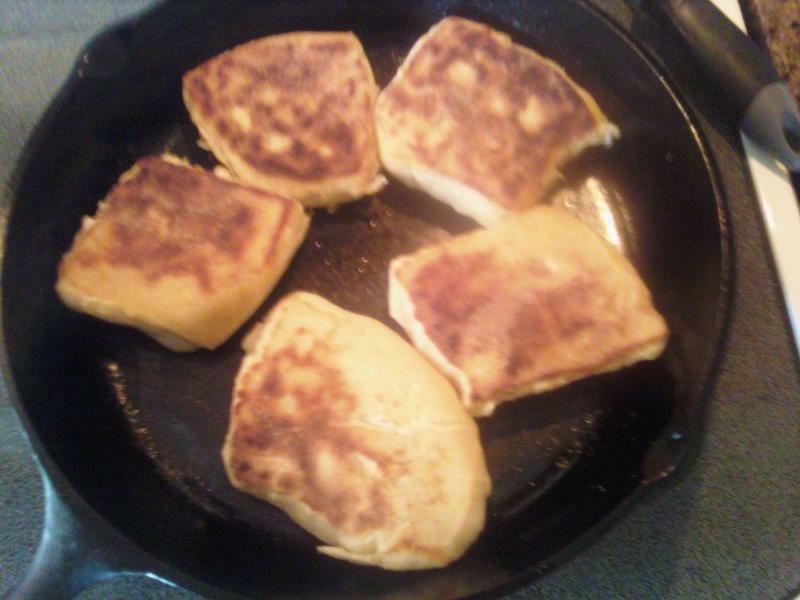 These have great griddle spring and rise quite a bit during the "baking". Split with a fork and enjoy with your favorite topping! I don't even toast them if I want to eat them right off the griddle--they don't have that raw taste that storebought english muffins have. Those are some good-looking muffins in that photograph! 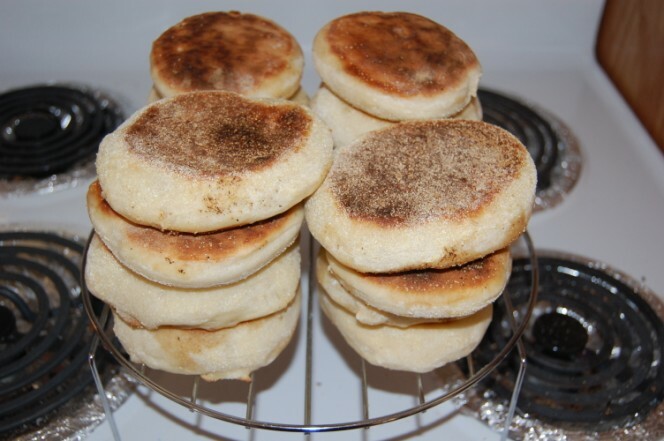 The KA recipe for sourdough English muffins is one of my favorites. It has been a few months since I last made any, so maybe I should get a batch going in the near future. Katie they look so yummy!!! I will try making your recipe tonite with the excess from General Chaos. Then let it sit out overnight! Thanks, everyone! They're quite yummy. Katie, those sure as heck look yummy to me! Wow. Yum. Must add to the list of so many things I need to make. I simply love English muffins and have not actually eaten one in years. I think homemade is definately in order. Really pretty muffins. Thanks for posting your recipe as well. and cooked them in my cast iron skillet. Yours turned out much prettier though! But mine still eat good. I made homemade egg mcmuffins and cottage browns with sliced grape tomatoes for brunch. Man was it good. Thanks so much for the piccys and the recipe!! Okay now, stop it! You keep giving me these great ideas for eating!!! I adore homemade egg Mcmuffins. Ohhhh they were awesome my friend! Totally rocked our world today! :D Haven't had an egg mcmuffin in a hundred years and it really hit the spot. The grape tomotoes on the side with sea salt and pepper were a refreshing addition to the hashbrowns and mcmuffins! mcdelicious! Odd that we call English muffins English muffins when they call them crumpets. Nevertheless, here shows my neuroses... Since I still don't have an oven and therefore haven't baked bread for a couple of weeks (gadzooks! it's been nearly three weeks), having decided to make this recipe, without left over starter which I had none of, I had to make some. I'm lousy at guessing how much weight makes how many cups so I ended up with too much left over starter, and I can't throw any away, that's the very reason for this recipe... so I increased the recipe by 50% and made a lot of them too small because I don't have a cutter larger than about 2 1/4" in diameter. The family went nuts and sucked them down like uncouth aboriginies, as the Brits were wont to call them... I et the last couple this morning and expect I have to make more again, even though I am baching it for the rest of the week. But they were a more little like southern bisquets than crumpets. How do I get that store-boughten crumb, or is that not really the desired crumb? Is is hydration, I did mine fairly wet, or cooking temperature, or moon phases? Was it that they were too thick (3/4" as prescribed) for their diameter? BTW, what spring! I could have made them 1/2" thick and they would have cooked faster... blah blah blah. Are there any answers out there? I have a picture of them here www.mulliganstewme.blogspot.com - they are the first post where I talk about them. The crumb is so moist, that's why I like these better than store bought :) . I did toast others that were leftover from my adventures (btw, I only have a waterglass that I use for mine, about 2-1/2") and the crumb dried out nicely. A crumpet looks like an over-risen pancake. It's made with a batter, rather than a dough, and it has burst bubbles on the top side. I think you put rings on the griddle then pour the batter into them. I love the ones from Wolferman's. They're smooth and satiny in texture, rather than craggy and bready like English muffins. Thanks Rosalie, Katie and browndog! I'm kinda embarrased to say I've never eaten a crumpet nor have I seen one then! How do you eat them? Do you eat them like an English muffin? Are they kinda pancakey (spongey) or is the crumb bready? 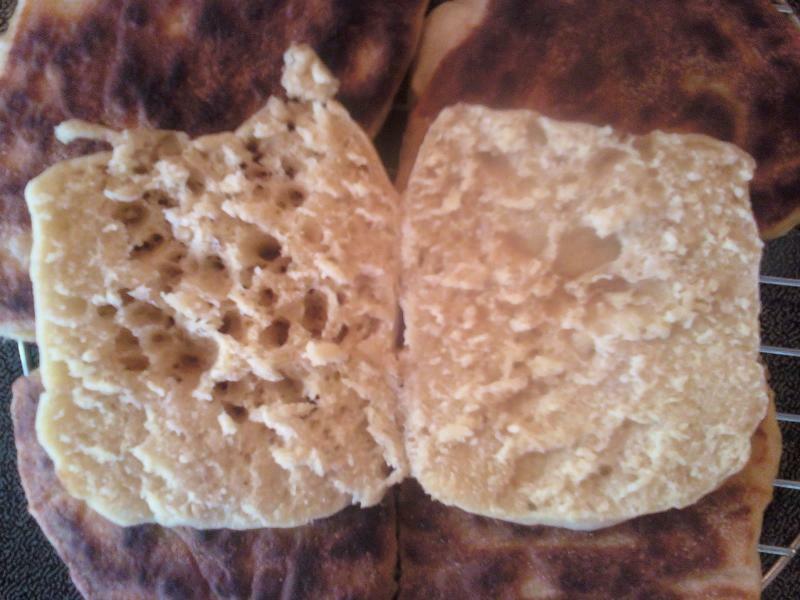 Does anyone have a crumpet recipe? Here is the Elizabeth David version of crumpets. If you don't have her book, English Bread and Yeast Cookery, you should try to get it. Warm the flour in an earthenware bowl in a low oven for 5 minutes. Warm the oil, milk, water and sugar to blood heat. Use a little of this to cream the yeast. (I proofed active dry yeast in 1/2 cup warm water.) Mix the salt with the warm flour, stir in the yeast, pour in the liquid, and stir the batter very well and vigorously, until it is smooth and elastic. Cover the bowl, leave batter to rise at room temp. until the whole surface is a mass of bubbles and the mixture looks as if it were about to break. This will take 1 1/2 to 2 hours. Forestall the natural falling of the batter by beating it down yourself with a wooden spoon. Dissolve the baking soda in the warm water and stir it into the bowl. Cover the bowl and leave the batter to recover, for about 30 minutes. This time, put it in a rather warmer place, unless you need to delay the cooking of the crumpets, in which case use cold water for dissolving the soda and remove the bowl of batter to a cool place. 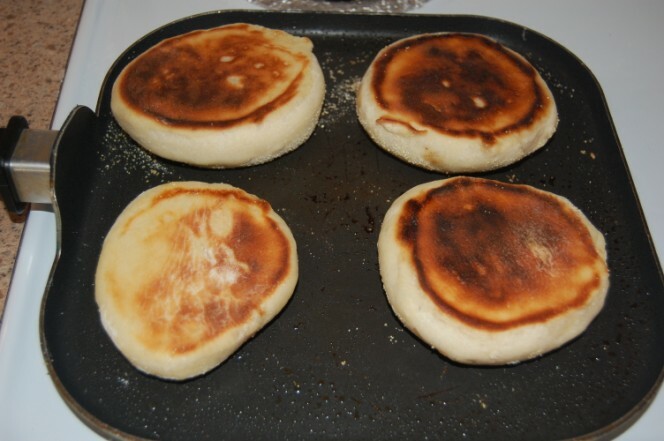 To cook the crumpets, grease the griddle very lightly, also the crumpet rings. 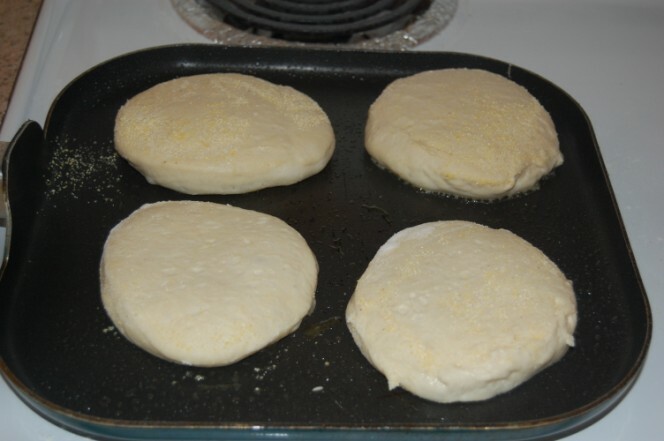 Put 4 rings on the griddle, pour enough batter into each to come almost to the top. Let them cook very gently, 7 to 10 minutes. By this time there should be a mass of tiny holes. If the holes haven't appeared, the batter is too thick. Add more warm water or milk to the batter before cooking the next batch. Once the crumpets have set, it should be easy to slip off the rings and turn them over. They only need 3 minutes on the other side. 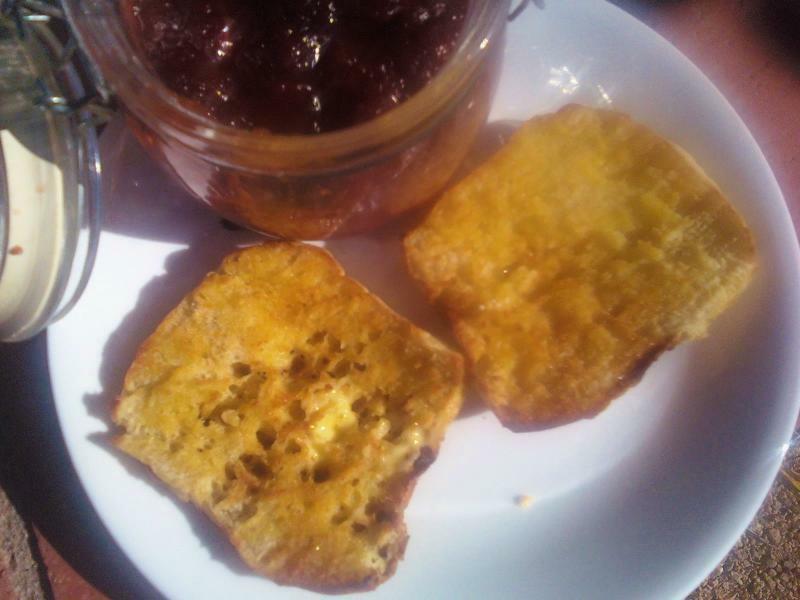 Bluezebra, here is what Elizabeth David has to say about her crumpets: "Personally, I find crumpets edible only when freshly cooked, warm and soaked in plenty of butter.Toasting makes them tough and alters the whole structure. I think it preferable to reheat them in a covered dish in the oven, with butter. 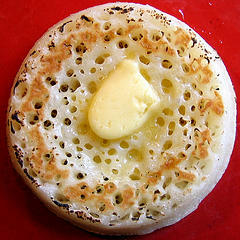 When all is said and done, crumpets are only yeast pancakes confined to rings and so made thick and of a uniform size." *with apologies to Katie for what is I hope is more like a 'can we stop here just for a minute-' rather than an utter thread-jack. Thank you for the recipe browndog! Are they difficult to make or easy? Scale of 1-10? I just might try making them this weekend. 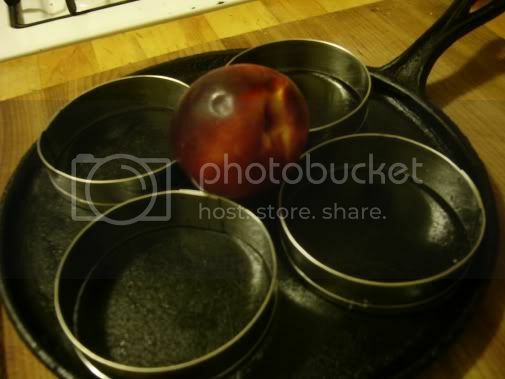 Have to go see if I can find some cheap rings for the griddle. My griddle is the double burner variety so does the crumpet batter escape readily from the ring or is it thick enough for the ring to contain it? Maybe a 4 on my scale just because they don't come from a mix...it should be thick enough not to escape (much anyway,) and of course your griddle should be hot enough that they start cooking right off, like fried eggs, you know? And by the by, rather than getting special rings which admittedly are pretty to look at, you can use the old standby tuna fish cans if you eat about 4 or 8 cans of it between now and the weekend...as to Elizabeth David, her book is not artisan in the 'modern' sense but if you like history and Britain and a chatty writer, she's terrific fun. don't have any at the moment! lol! >aside to Lee: I wouldn't fret much about misremembering, Lee- you've gone and sparked an adventure. reporting on the outcome of the crumpets. I don't know if the link came through. I can't see it on my puter... www.mulliganstewme.blogspot.com I've linked my write up.) I think they turned out pretty good for a first time. Texture wise they were delicious although they could have had more bubbles on top. They look like an English muffin but there is where it ends. They ARE more like a thick pancake, just as you've said browndog. The flavor though is more like a blini. I thought they were gorgeous really. Much better than pancakes and more festive. All in all they were well worth the effort of making a new recipe. Thanks soooo much for your recipe and encouragement. Hey I forgot to ask you, was I supposed to split them like you do English muffins? Or was I supposed to serve them whole like I did? TIA! reporting on the outcome of the crumpets. I've linked my write up.) I think they turned out pretty good for a first time. Texture wise they were delicious although they could have had more bubbles on top. They look like an English muffin but there is where it ends. They ARE more like a thick pancake, just as you've said browndog. The flavor though is more like a blini. 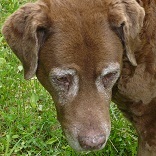 Bluezee, your instinct not to split the crumpets was correct, at least as per the dictates of tradition. (Something I learned in Elizabeth David was that you're not officially supposed to split and toast English muffins, either, that is, you're supposed to split them but leave them whole and toast only the outer sides before you butter and dress them. Ha.) I stopped by your place to admire the results and say a word or two. Any idea why my links aren't working to my blog? I talk about The Fresh Loaf and put links all over my site to the site here? Confused?? Oh, Ruth--would you consider sharing the recipe? Baking in the oven sounds so much simpler. Heat milk, water, sugar and salt to boiling. Stir in butter and let cool to lukewarm. Beat in egg. In large bowl, combine the yeast and flour. (Yes it works) Using electric mixer, gradually beat in liquid until smooth with a loose, sticky consistency. Cover and refrigerate over night. Butter the inside of 12 muffin rings. Dip each in cornmeal and place on a large baking sheet sprinkled lightly with cornmeal. Stir down dough with rubber spatula. it will still be sticky and elastic. 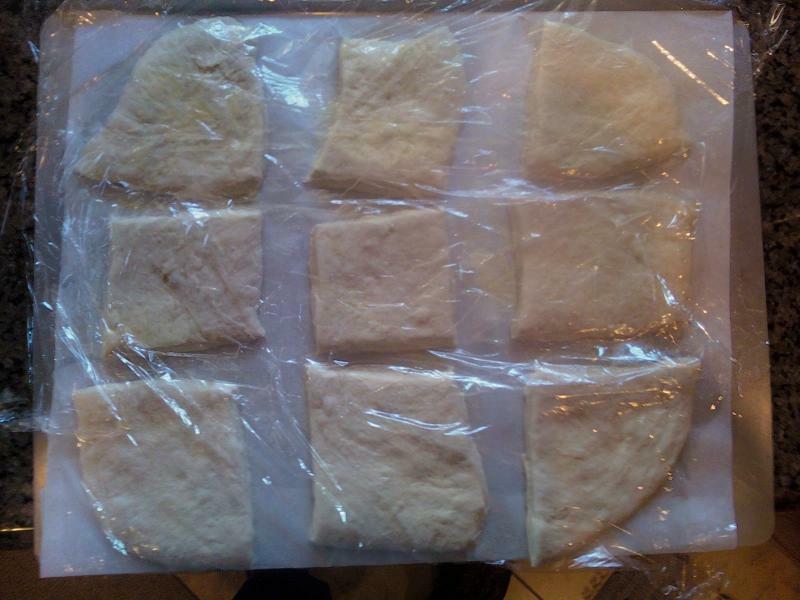 With a large, sharp knife, cut the dough into 12 equal pieces. Fill the rings with the dough pieces and sprinkle on more cornmeal. Cover loosely and let rise in draft-free spot til doubled about 45 minutes. Preheat the oven to 400 F. Bake in lower third of oven for about 25 minutes or til lightly browned. Let cool on baking sheet on rack for 15 min. Remove the rings, transfer muffins to rack and let cool. Can be frozen for up to a month. Toast before serving with butter, jam, or ? It's does take time but they are great. This was my first try with sourdough starter. Goood! Ruth that sounds like a lovely recipe! Quick Question regarding "wetter dough" and hole size.. I'm interested in trying out these English muffins too, but have 1 question. In the original post kiknits it says, "I know a wetter dough would create larger holes, ..." but they never added in the last 3/4 cup of flour, wouldn't this made a wetter dough? If the last 3/4 cup of flour had been added the holes would have been even smaller? I plan on trying this soon!! Hi, bakebakebake! I was referring to the english muffin recipes that are more of a batter than a dough. While this recipe is a dough that you cut with round cutters, there are other recipes which use griddle rings to keep a more batter-like dough together on the griddle. Those recipes are supposed to yield much holier english muffins, although I have never tried one of that nature. Hi Rosalie! Yes, lots going on here. I have been working on a consulting project for an insurance company which has been a huge time-spender, and I also started doing a few extra activities in my church, so spare time has been limited. I haven't been baking as much as I was last summer, but not because I haven't wanted to! I do still keep up with the sandwich bread, because my family (the kids in particular) won't eat anything else. And I just got a new Viking 7 qt mixer that is awesome! I can mix up the dough for four 1.5 lb loaves at once! And then I was able to give my old KA to a friend who disn't have a stand mixer. Win/win, if you ask me. thanks for the recipe, just used up my leftover starter and made these little morning treats. or afternoon. or dinner. delicious! I've done this more than once now, and have been meaning to post about it. Recipe/idea is killer. I ended up eating most of these at school with some pickled bellpeppers, butter, and raw sharp cheddar. I did one or two with peanutbutter and Weichsel (German sour cherries) and those were also nice. 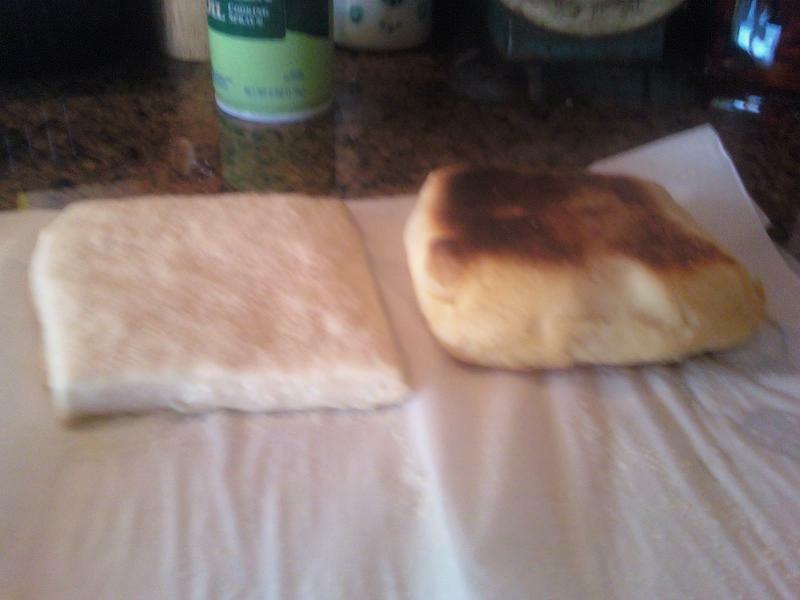 I only did one in the official English muffin shape (pictured), and did the rest squarish because I wasn't interested in coffeecupping and re-rolling so much. I made these yesterday morning.They are my very first english muffins using my sourdough starter. How exciting! I used the original recipe at the start of this thread but after the overnight rest, I stirred in the remaining ingredients(minus the last 3/4 cup of flour), let it rest a few minutes while I prepared my rings. Then I sprinkled corn meal on a cookie sheet, placed the rings, added the dough to the rings( it was goopy so I used an ice cream scoop) and sprinkled a bit more corn meal on them. I let them rise about 20 minutes while the oven was heating, but it was past breakfast time so in they went. I am thrilled! Baked them at 425F for about 15 minutes and I flipped them about 10 minutes in because a couple of them were getting a little too muffin-topped. That worked perfectly to flatten and also brown the tops. I made 8 muffins because I had that many rings, but next time I'll only make 6. We like a fairly thick muffin. They are wonderful! Hubby voted them a keeper recipe. Hi thought you might want to see a double batch just as easy to make. I use a 4 inch Tuna can to cut. 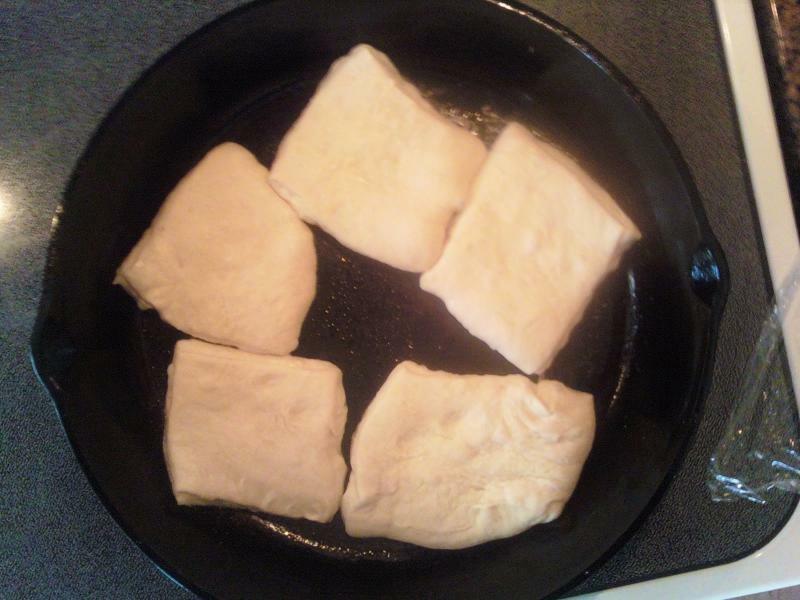 The dough rested in the refrigerator for 2 + days as I could not grill the next day. Very nice taste and better than Thomas I heard from a few folks. I have posted on another link. One thing I had to do was add about 1/2 cup of flour to be able to work with the dough. I like your muffins also . They look great. lookin forward to using my new starter with these....cool post! Some sites show what I would call a drop scone - a griddled batter 'cake', (like a US pancake) with no holes - a pikelet/crumpet should have holes, caused by the raising agent, so that the butter melts down them! Shop bought ones need tooasting on both sides before the butter, or if you are topping them, toast just the base till it goes crispy, then flip over, top and then grill - they are also great as mini pizzas, with tomato paste, herbs, and then cheese, grilled. When we moved from Birmingham to Buckinghamshire 15 years ago, we realised that by moving 70 miles south, a whole new world of language opened up! buttered and jammed!!! I got 9 out of my batch and the spring was at least 3 times the original height. Are you sure we aren't making Puff Pastry here? Oddly, the crumb shot shows that one half had nice open holes but the other half didn't. I wonder if it has something to do with which side hit the pan first? Thank you for the recipe!! Tonight I made the English muffins and they were great. My family loves them. I did change one thing. I didn't have a starter, so I used my own Kefir that I make. I used the same proportions as the recipe. It worked great. Thanks so much for this recipe. It is a keeper.